Former Celtic superstar, JoJo White, died recently due to complications from benign brain tumor surgery in 2010. 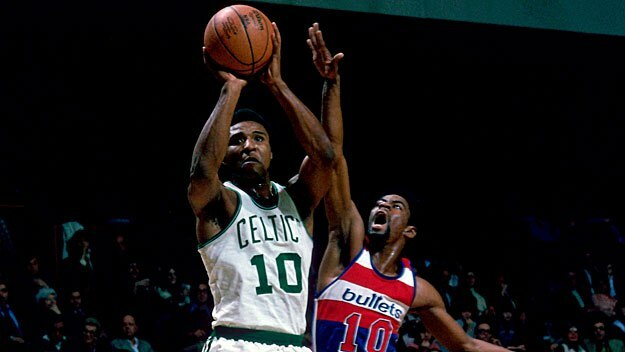 He was a mainstay of the Celtics teams of the 1980's, along with John Havlicek and Dave Cowens. What many Boston fans don't know is that Red Auerbach pulled another fast one on the League in drafting White. JoJo fell to the ninth pick in the 1969 draft because he had a two-year military commitment after leaving college. The players chosen before him were Lew Alcindor, Neal Walk, Lucious Allen, Terry Driscoll, Larry Cannon, Bingo Smith, Bob Portman and Herm Gilliam. Lew (Kareem Abdul-Jabbar) and White were the only two players in that group to go to the Hall of Fame. After acquiring JoJo, Red finagled an early exit from the military (Marines) for White, who was then able to join the team for most of the 1969-70 season. The big three of White, Cowens and Havlicek may not have been the best trio to ever play in the NBA, but they were one of the most exciting. They were small, quick and tenacious - and they won two Championships together. JoJo was known for his mid-range jump shot, and he cocked his arm like the hammer on a gun before firing the shot at the rim. Cedric Maxwell got word that his old Boston Celtics teammate Jo Jo White died on Tuesday just before Maxwell was about to go on radio to give his usual analysis of the Celtics game. Sadness engulfed Maxwell during the broadcast. Not able to say much more, Maxwell left the TD Garden in Boston in the middle of the first quarter to go home to grieve. Most of today's Celtics fans know of the early drafting of Larry Bird, the 2-for-1 Kevin McHale and Robert Parish for Joe Barry Carroll and other shifty moves by Auerbach, and later by his student, Danny Ainge, but most don't know about the draft-JoJo-low-and-then-yank-him-away-from-the-Marines caper. What a conniver! The sharp-dressing, classy superstar, JoJo White, is gone. "True gentleman" really describes him. He went too soon.